Colors have several properties to explore: hue, value, intensity, and temperature. Intensity (also referred to as saturation or chroma) refers to the degree of purity of a color. A highly intense color is bright and a low-intensity color is more neutral or muted. Colors are at their purist when they are straight out of the tube, not mixed with another color. As soon as you mix in another color, you have lowered the intensity of both colors mixed. Learning how to vary the intensity of a color gives you control over color choices and creates beautiful color effects. A color’s intensity always diminishes when it gets mixed with another color. The farther apart on the color wheel the two colors you are mixing are, the more the intensity of both color is diminished. 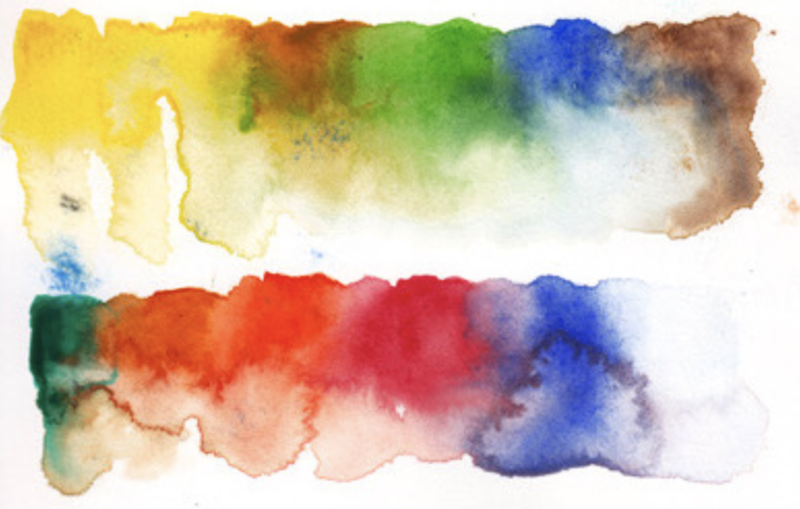 Ultimately, mixing two colors that are completely opposite each other on the color wheel (complementary colors) creates the least intense (most neutral) mix. To better understand these ideas, make an intensity color wheel study like the one pictured above. The swatches are made by mixing complimentary colors. On one end, have a pure color, unmixed, Then slowly add it’s complement to it to see the desaturation. Add more and more of the complement until you end up on the other end with just the pure complementary color. In the middle, you will find that you’ve created neutral mixes of all your colors. Neutrals are muted down versions of the colors you are mixing. The term neutral color also applies to colors such as blacks, greys and whites. In theory, a neutral color is a color which is neither warm nor cool. Such colors result from the combination of two complementary colors (such as, red and green, blue and orange, and yellow and purple). But you can push neutrals towards warm or cool by adding more of the cool or more of the warm color you are using. 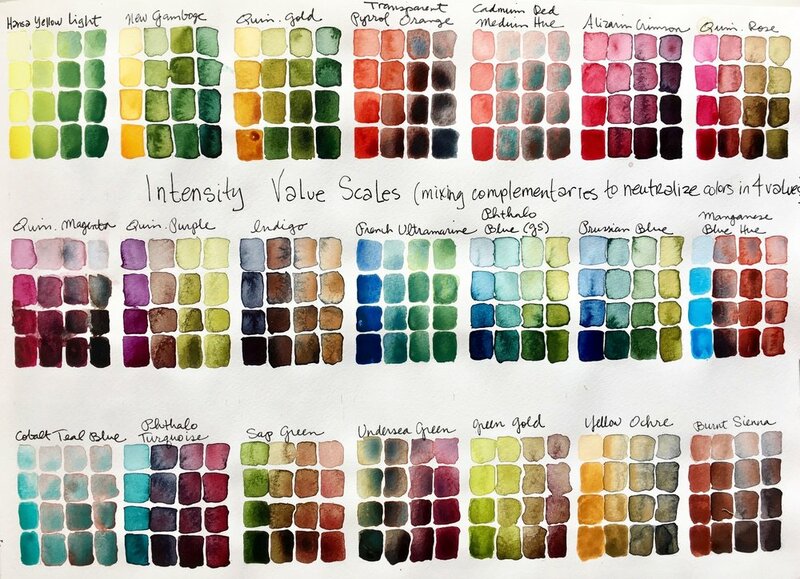 Another great exercise is an Intensity & Value Scale chart for each color you have. Pick a color and make four squares of value with it from top to bottom on the left hand side of your page. To make four square of value, you just add a bit of water to your paint to get a lighter value. Next, add enough complementary color to it to get a light gray and paint in the four boxes next to the ones of pure pigment you already painted. Each box should darken in value as you go down the scale. Make a third mixture with even more of the complementary color in it and paint the four squares from lightest to darkest top to bottom. Then paint your last row which will have a lot more of the complementary color in it. Again paint that mix in four values. You will end up with a good sense of each color’s intensity and value range. And you will have a beautiful page of color mixes! You can also lower a color’s intensity by mixing in grays, earth tones, and darks. Some colors are naturally highly intense (like Opera Pink) while others are low intensity colors (such as Yellow Ochre). Neutrals, less intense mixes, are often the most beautiful colors. Get friendly with them!